I’ve recently signed up to graze.com. For those who are not familiar with graze, they offer a range of healthy snacks which they deliver to your door every week with a different selection of nuts, seeds, crackers & dried fruits every time. I’m a big fan of their concept, their branding, their snacks, even their eco-friendly boxes! So I decided to take a closer look at one of their emails. I get my graze box delivered every Monday and I always get an email a couple of days later. Graze wants to know if I liked the selection of snacks received. This feedback will help them customise my next box to my tastes and preferences. Let’s take a look at the header first. I like this subject line because it shows that the brand cares about its customers and it helps them provide a better service for every new delivery. Using ‘rate or slate’ makes you want to be involved. 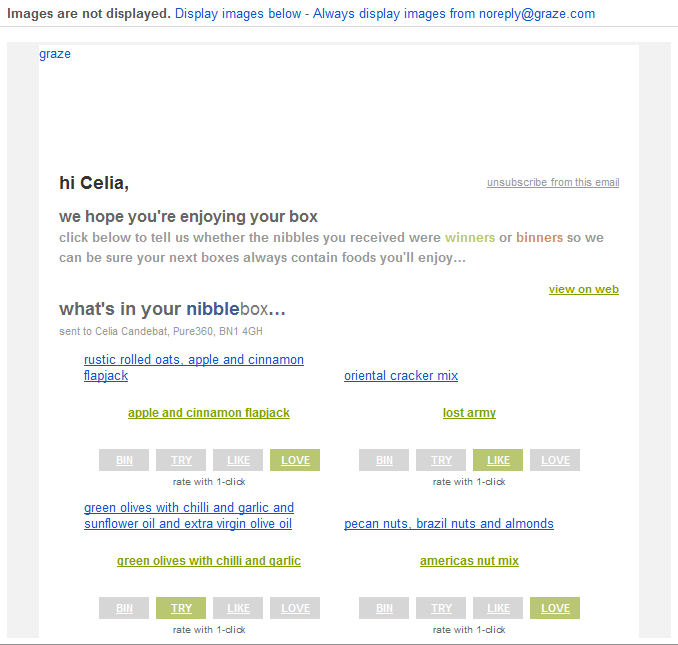 Even if I don’t click on the link ‘Display images below’ I can still clearly understand what graze expects me to do here, the email is very easy to read and links and images are highlighted. Also in the first half of the email I can easily find links such as ‘view on web’ and ‘unsubscribe from this email’. These should always be visible, generally if recipients want to unsubscribe they will, there’s no point in hiding the unsubscribe link away at the bottom. This email is nice and clear and easy to read. However there are a couple of things that could be improved. You can click on the links Get in touch or FAQs but that is only indicated in the footer. Having a reply address such as contact@… would be more customer friendly. The Twitter logo is only visible if you display the images. This is a real shame! There is no alt tag or link to indicate the Twitter link when the images are turned off. Moreover social media links usually have more impacts when placed in the header. If you do click ‘view on web’ you are then directed to a landing page which lets you rate your box and also invites you to share this box with your friends on Facebook and Twitter through share buttons. Why are these buttons are not present on the email?! Nice email easy to read even when the images are turned off – with personal approach and clear links in the header. However I do think graze is missing a trick in terms of integrating its social media with its email marketing.